Leisen is a small village of about 850 people located in Southwest Manipur near the states of Mizoram and Assam. Leisen is one of many villages situated atop the lush, green hills in this area. Leisen is home to the Hmar people. The local people of Leisen are mainly farmers, growing crops of wheat, rice, chilies, and ginger. The primary mode of transportation in Leisen is walking. Leisen Partner Mission School is a small school making a huge difference. 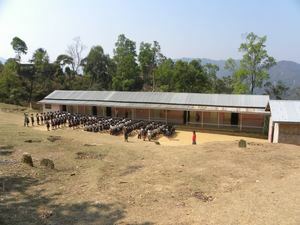 Historically this is an area where many of the people have not been formally educated, so this school is truly changing the future for the next generation. Leisen Partner Mission School has nine staff members and an enrollment of around 115 students.